This children’s book is quite hard to find, but worth tracking down. It is a rare and forgotten children’s book by the author of Doctor Doolittle, and surpasses Doolittle in almost every way. The book is divided into two parts, which are separated by about ten years in the life of the main characters. 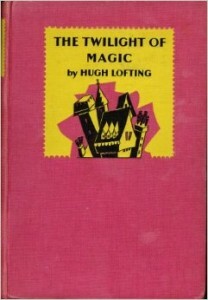 The first part shows two young children encountering a magical woman, who, unfortunately in those times, would be considered a witch, and persecuted. While that is a hard message for children to hear, it is also true. However, the main part of the story is the magical gift that the woman gives the children and how they use it. The second part of the book takes us to a castle, where we see the results of the gift, and an unexpected love story unfolds. The book is set in the middle ages in England, but it’s not really so much a commentary on life at that time, although the presence of knights and kings adds color to the book. Rather, this children’s book is more about belief in the unseen worlds, and learning to see the magic that is also possible in daily life. The characters in the book are fascinating, and unlike those we might meet in other books. I loved this book, and was totally delighted with it, at the same time, disappointed that it has gone out of print. It would be a fine book for Waldorf curriculum studying the middle ages. It’s also just a good, interesting read. I do not recommend using Amazon to buy this book, as they promote only expensive versions.. First check your public library. Then, look at Abe Books, where there are many reasonably priced versions. Here’s a link you can use. Good luck!